Werner, A., Hötzl, H., Käss, W., Maloszewski, P. (1997): Interpretations of Tracer Experiments in the Danube-Aach-System, Western Swabian Alb, (Germany) with analytical models, Proc. Of the International Symposium on Karst Waters and Environmental Impacts. Balkema, Rotterdam, The Netherlands. 1719 first decription of the danube sink near Immendingen by Breuninger. 1865 other swallow holes discovered during the construction of the railroad bridge near Immendingen. 1874 Schwarzwald-Donau (Black Forest Danube) sinks complete near Immendingen. 1877 first use of Uranin to mark the water by Knop. 1884 start of the recording of days with complete disappearing of the Danube. 1911 Schwarzwald-Donau (Black Forest Danube) sinks complete near Immendingen. 1921 Schwarzwald-Donau (Black Forest Danube) sinks complete near Immendingen. 1928 Schwarzwald-Donau (Black Forest Danube) sinks complete near Immendingen. 1943 Schwarzwald-Donau (Black Forest Danube) sinks complete near Immendingen. Image: the sink of the Danube near Immendingen. The water level is a bit too high, so not all of the water is swallowed, but the decrease of water is easy to see. The Donau (Danube) springs in the Schwarzwald (Black Forest). After leaving the Black Forest the Danube flows to the north east at the southern rim of the Schwäbische Alb (Swabian Jura) and later the Fränkische Alb (Frankian Jura) towards Regensburg. He it bends to south east and leaves Germany near Passau. After many hundred kilometers it flows into the Black Sea. But from the water which springs at the Danube Spring, only a small part arrives at the Black Sea. Most of it flows into the North Sea. This seems absurd, as the Danube flows into the Black Sea, and the Rhine flows into the North Sea at the opposite end of Europe. The border between their drainage basins is called the European watershed or European drainage divide running through middle and eastern Europe. So the water of the Danube crosses the watershed. It seems strange, but the explanation is rather simple: the upper Danube area is catchment area for two big river systems, as the water is forked and flows into two rivers, Rhine and Danube, at the same time. But the catchment area or drainage basin, is defined as an area drained by a (single) stream or another body of water. The limits of a given catchment area are the heights of land - often called drainage divides, or watersheds - separating it from neighboring drainage systems. This hydrogeologic water-shed-model is too simple to describe the complext karst hydrogeology of the upper danube. The Danube sink is rather unspectacular, but its a hydrogeologic site of world fame! The water is not flowing across the water shed, but passes the border undergound. Sinks in the bed of the danube at Donaueschingen and Tuttlingen, and later again near Fridingen, swallow a certain amount of water. The biggest swallow holes are at the Brühl in Immendingen, more sinks are near the railroad bridge. The swallow holes near Fridingen are about 2km from the town in a loop of the Danube, and are only accessible by foot. At some locations signs with schematic drawings explain the geologic situation. The karstified layers of the Malm (late Jurassic) fall to the south and are covered by the much younger sediments of the Süßwassermolasse, the remains of a great lake similar to north Americas Great Lakes. The water flows in the Malm limestone below the overlaying sediments to the Aachtopf (Aach spring) in the south. The speed of the water is from Brühl about 180 m/h and from Fridingen about 100 m/h. 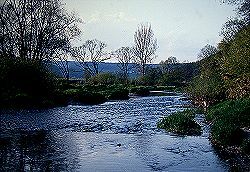 The Aach is a tributary of the Rhine. During the centuries, the loss of water in the Danube increased. The first time the Danube fell completely dry was in 1874. Now the number of days with complete loss of water increased continuously. The maximum was reached 1921 with 309 days! In the days of complete loss, the people talk about Schwarzwald-Donau (Black forest Danube), from the springs to the swallow holes, and the Alb-Donau (Jura Danube). The Jura Danube is "revived" by two tributaries, the Krähenbach and the Elta. While it seems, that the amout of water swallowed by the underground cave system increases continually, the days of complete loss are not a sign of higher loss on these days, but of lesswater in the river. In summer and especially in dry years the amount of water in the danube is smaller than the amount swallowed by the cave system. Increasing precipitation since 1950 reduced the time of complete loss. The water of the rivers Danube and Aach was always valuable for running mills. And as Danube and Aachtopf were located in (then) different states, there were soon struggles and fights for the water. The people at the danube tried to reduce the loss by filling the swallow holes with concrete. Soon the people at the Aach mentioned the decrease of water. At last the case was sentenced at the court in the 1820s.